Roberto Duran no fan of Donald Trump, says he’d like to fight him! 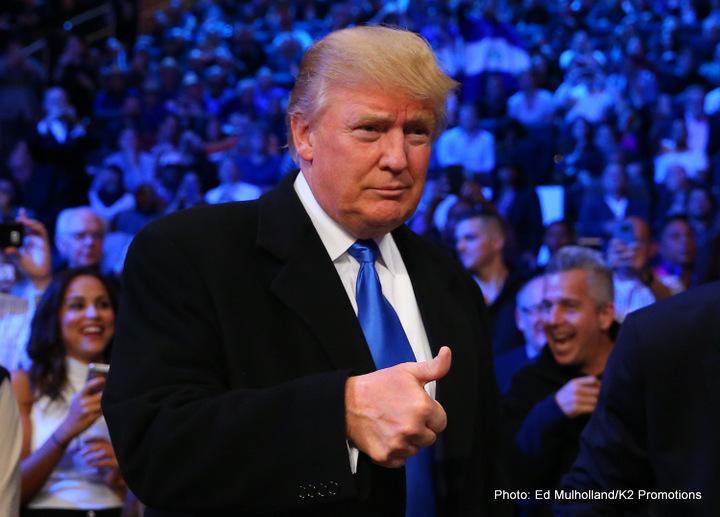 With the race for the Whitehouse rapidly coming to an end, with Donald Trump and Hilary Clinton seemingly neck and neck for the Presidency in 2017, members of the boxing world have given their opinion on the Republican nominee. Promoter and former Bobby Kennedy lawyer Bob Arum is absolutely no fan of Trump, angered over the 69-year-old’s comments about the Mexican people. But Arum hasn’t gone as far as challenging Trump to a fight. One boxing legend has: Roberto Duran. Duran was talking on a Q and A with Edgar Ramirez, the actor who plays him in the soon to be released movie of his life that also stars Robert De Niro (as his great trainer Ray Arcel) and its unlikely Duran was merely trying to hype up the flick. Trump is a phenomenon: a man, a politician, who has as many supporters as he has detractors (if that‘s a strong enough word.) Trump has, his critics claim, used hate as a way of generating votes. Even Don King has taken a step away from Trump. Duran is 65 now yet he has clearly lost none of the fighting spirit that made him a hero to millions. Is Donald Trump a hero? Not in the boxing world he isn’t. You are here: Home / Boxing News / Roberto Duran no fan of Donald Trump, says he’d like to fight him!